Another year passed very quickly and Ramadan is here again. Although I am not particularly the religious type, I can't ignore the presence of the holy month. The culinary tradition of Ramadan is incomparable to any time of the year. The whole month is a celebration of food, drinks and sweets. 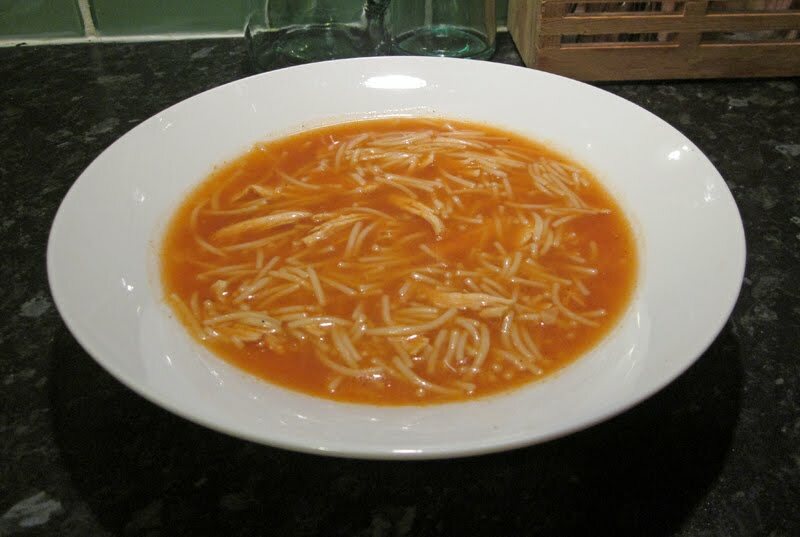 Today's dish is chicken vermicelli soup, a firm childhood favourite. Nice and strongly flavoured tangy soup, a perfect start for a Ramadan Iftar evening meal. Outside Ramadan the soup would make an excellent homely starter especially if you have some left over chicken stock and breast meat. Above all, this is the perfect meal if you are not feeling well. If chicken soup is the "Jewish Penicillin" this is definitely its Syrian counterpart. There are many variations to the recipe. I cook mine with tomato paste and shredded chicken. Some people use meat balls or no meat at all, just nice stock. You can omit the tomato paste if you wish or even fry the vermicelli in a little oil to give them colour and a different flavour before cooking them. To see the Syrian way of cooking chicken and making a delicious stock check my Chicken Fatteh recipe. Bring the stock to boil. Dissolve the tomato paste. Add the chicken meat and the vermicelli. Cook for 15 minutes until the pasta is fully cooked. Add salt and pepper to taste. The soup will thicken slightly because of the tomato paste but the consistancy should remain fairly runny. Chicken soup with tomato paste in it? That sounds worth trying. Yummy! Welcome to my blog. Glad I came across your blog. Somr delicious looking stuff on there. Give it a go. it really works well. 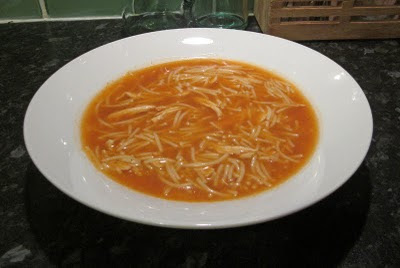 This is similar to one of my favorite chicken soup recipes and I too use vermicelli. I always throw some fresh cilantro into it as well as it cooks, which is a more Mexican twist. I am adding you to my blog roll just love your site mashAllah. Ramadan Kareem! Looks lovely. We eat a lot of soups during Ramadan. Thank you very much for the Ramadan wishes. Thank you for stopping by and welcome to my blog. I just discovered your blog and it is great. I left you the answer to your mysterious Cheese desert. I already know your blog and visit regularly. Really good. Syrian noodles - I love it. Are noodles common in the Syrian cuisine. As you guess, I have a slight obsession with noodles. We use vermicelli paste for this soup and most importantly to cook rice. Our rice of choice is vermicelli rice.